With the rapid pace of innovation continually disrupting business models, and in many cases entire industries, how will online learning keep up to provide the relevant courseware for today’s and tomorrow’s workforce? This will be essential for economic growth and to support a thriving, college-educated workforce that’s equipped with the very latest knowledge, ideas and technology. In the future, I believe that institutions at the forefront of online education will be recognized via several capabilities which will have digitally transformed today’s EdTech market. They will include a powerful combination of omni-channel learning pathways, cognitive courseware, virtual counselors and AI-enabled course development and grading. These innovations, underpinned by artificial intelligence (AI), will help to provide students the ultimate choice in their courseware – including up-to-the-minute courses on high-interest/high-growth subject matter – as well as highly-innovative digital services that support them every step of the way to help maximize their success and personal objectives. Firstly, online education will have evolved beyond omni-channel (anytime, anywhere) to omni-choice whereby students will be able to select and configure every pathway in their learning journey to personalize and customize their near-term and long-term learning plan and approach to their unique situation, needs and interests. As an example, with self-driving cars commonplace – learning will be conducted at home, in class or on the road during lengthy commutes, with students able to pick up and resume their online courses on any device in any location and in any duration and format. AI will help to hyper-personalize this omni-choice functionality so that students can focus more on their actual learning and less on the mechanics of their learning. Online classes will have evolved from simulations with limited permutations, to more sophisticated interactive, technology-based experiences (e.g. North Star Learning Group’s I-L-X with “hundreds of thousands of paths through the games”) to enable students to learn by doing and from the decisions they’ve made. Digital strategy advances from other industries such as healthcare, where the traditional delivery model is being disrupted and moving into the home via technologies such as wearables and IoT, will be regularly applied to the education sector to bring the institution into the 21st century. As an example, emotionally-intelligent virtual assistants (see “virtual counsellors” below) will monitor student attentiveness and verbally suggest when students should take a break or switch to a different learning modality. They will also help “at risk” students stay on track. Hybrid classroom/online courses will maximize the best of both worlds and will be customized and personalized down to the individual student while still being consistent and coordinated for multiple students and teachers. In addition, there will be considerable blurring of digital/physical learning options, techniques and possibilities (e.g. 3D printing, digital twins, AR/VR) with students no longer making distinctions between one or the other. Virtual counsellors, available in a variety of interaction styles including voice, wearable, AR/VR and even humanoid robotics, will help students with guidance and mentorship across every step of their higher education and continuing education journey from institution and course selection, to course engagement and completion, to career planning and even to employment / gig economy suggestions, analysis and match-making. Rather than replacing human counsellors, they will augment the work of the counsellor so that human counsellors can focus on most meaningful and strategic work activities (much like the present-day, emotionally-intelligent Amelia virtual agent can handle level 1 phone support, but hand over to a human agent for more complex support requirements as and when needed). With the gig economy (freelancing) having overtaken traditional full-time employment by 2027, the academic market will have industrialized the production of online courseware to quickly develop and deploy online learning courses that meet the fast- and ever-changing needs of freelancers as they compete in the global labor market. 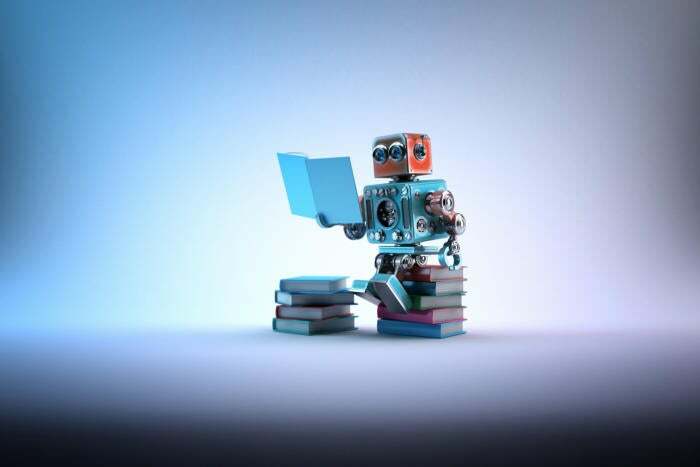 As an example, course developers at leading institutions will utilize AI technologies to help them quickly assemble their courseware and reduce the manual effort required by up to 80 percent. This frees up course developers and administrators to be more strategic and plan their portfolio roadmaps in close collaboration with business and community partners. Trainable AI (much like “trainable” collaborative industrial robots from Rethink Robotics), will be able to observe a physical class via machine vision and thereafter create a template or blueprint for the online equivalent of the course. This will speed online course creation and the ability for leading institutions to produce up-to-the-minute courseware. In addition, AI-enabled course grading will be at highly advanced stage in 5 to 10 years where course administrators will be confident of the fairness and accuracy of automated free-text grading algorithms due to advances in machine learning, semantics and natural language processing. If they have questions about a student’s grade, they will be able to speak with the AI system, understand the rationale, and adjust as and where necessary. While the future of learning technology will be very different from today’s environment, I believe the brand and reputation of the institution delivering the courseware will be as important, if not more so, than it is today. Students will look for courseware that’s leading-edge in terms of its subject matter, digital delivery and support mechanisms (to give them the best in experience, price, selection and availability), but will also look at the pedigree of the institution, faculty and staff and what they – and their alumni – stand for in their community. I believe the most successful institutions will be those that develop a robust and respected innovation ecosystem of educational, business and community partners, a world-class faculty and staff, and who achieve market success by offering a vast selection of digitally-sophisticated courseware that keeps pace with a rapidly-changing world. Leading institutions will embrace both business-driven and purpose-driven objectives and constantly strive to improve the world around them. Digital strategy, innovation, emerging technologies (including 3D printing, AI, AR/VR, autonomous vehicles, blockchain and IoT), and collaborative ecosystems may be some of the tools and methods, but ultimately it will be the people involved – working towards a shared vision – who will make the difference.